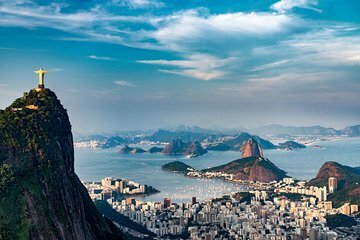 Ontdek Rio's hoogtepunten tijdens deze sightseeingtour door de stad. Ontmoet je gids in je accommodatie in Rio en vertrek in een minibus om de bezienswaardigheden van de stad te verkennen. Stop bij het Tijuca National Park om wat dieren in het wild te zien voordat je naar het beeld van Christus de Verlosser gaat. Verken de omgeving van Santa Teresa voordat je de tour eindigt bij Sugarloaf Mountain om te genieten van de zonsondergang of terug te gaan naar je hotel. I booked this tour via Viator and it was outsourced to Kantu Peru tours however when we went for the tours it was outsourced future with a number being done by Ecotours. Day 1- half day tour of Cusco. Hotel: los portales- nice interior. Close to temple of the sun. Small rooms, good breakfast. Pick up poor- punctual, drop around a bit to pick up the rest then was brought to a bigger bus parked outside the city. We then were told to get off as it was for a Spanish tour and joined the English tour when the smaller bus turned up. Our tour guide was below average, rather patronising and irritating.talked unnecessarily for most of the transfer which can only be described as verbal diarrhoea. We then were left in ollaytaytambo to walk to the train station to catch our Inca Peru train to Aguas calientes. I'm sure we were meant to be dropped of but they could be asked. We arrived in Aguas and the tour representatives wasn't there. We managed to find the hotel- inti puntu- average with basic room and was on the 5th floor with 8 flights of stairs. This was an excellent tour thanks to Jessie. She was patient , knowledgeable and very professional. The tour went well. We finished at 9.45am after 2hours and 45 minutes. We then did the Inca trail to the sun gate. We took the 1612 back to ollaytaytambo and then another 2hours bus ride back to Cusco. Day 4 - Maras, moray, las salines. Hotel- royal Inka 1, great location, bigger rooms than los portales, good breakfast, complimentary welcome drinks and helpful staff. Tour guide was good and knowledgable.this tour was more cultural with a stop at Chichero to see some Quechuan culture/art making. Day5- rainbow mountain. This was an extra, again outsourced to Eco tours. 4.30am pick up then a 2hours travel followed by breakfast and then a further hour. Guide- average, talked about the hike, tips etc but little on the actually mountain. Nature or formation of colours. Via the 1hour bumpy roads and turns further two hours to Cusco. In all the hotel upgraded was a good idea but the price quoted is higher with the hotel upgrades and also with the addition of rainbow mountain. Guides vary between excellent to slight below average.